We are so proud of our sweet baby. She is working so hard to get off this ECMO machine and today was another good day with steps in the right direction. They turned down how much oxygen she's getting from the pump, turned up her ventilator settings and we saw great results with much improved tidal volumes (how much she's inhaling/exhaling) throughout the day. Her chest x-ray looked better too - her lungs continue to aerate and grow - and today's echocardiogram (heart ultrasound) showed "marginal improvement" from yesterday's. We'll take any kind of improvement at all! They're weaning her down on the epinephrine which is a good sign that her heart is improving too. Her heart is still shunting multidirectionally and we need to see her begin to shunt left to right (that will indicate that her pulmonary hypertension is resolving). They started some more lasix today and she has been peeing really well - she was negative so far for the day when we left (more output than input -that's good!). The big highlight of the day is that we gave her the first "test drive" off her ECMO pump. They completely turned off her "sweep gasses" (the oxygen she's getting through the ECMO pump) and she relied on her own lungs to oxygenate her blood for several minutes. We knew it wouldn't be permanent... they compared it to riding without training wheels for the first time. But she lasted a good 10 minutes or so without any residual oxygen before we turned everything back on and gave her a chance to rest. We were so anxious, nervous, excited and proud. She did great! She's not there yet, though. 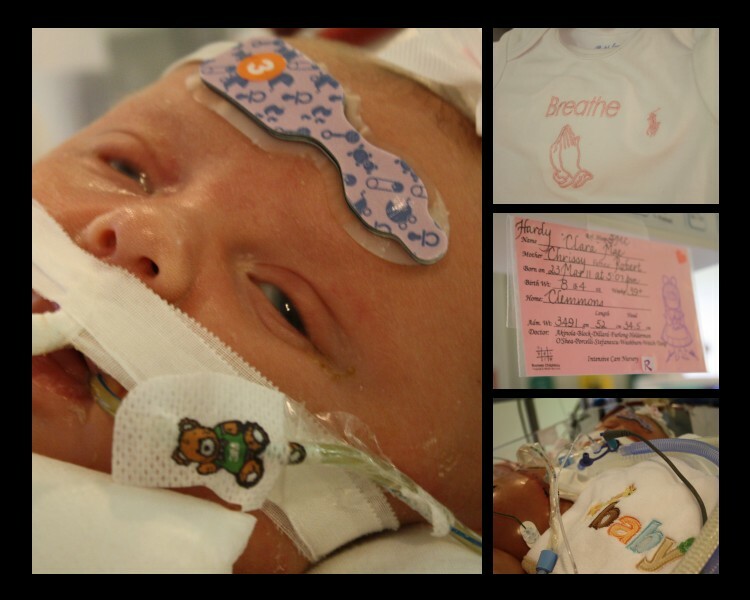 After a while, her oxygen saturations began to drop, and her C02 levels started to rise, so she's not yet at the point where her lungs can transfer all the gas they need to. But the doctors told us to expect this and that "if we hit a home run on the first try, then we waited too long to test her." We'll do another little test drive again tomorrow and see how it goes (hopefully it will last a bit longer) and we'll just keep going like that until we don't have to turn anything back on. Each of these practice runs is good exercise for her lungs and preparing her for the time when she's really ready to do it all on her own. Once she's had everything off for a consecutive 24 hours, the surgeons will remove her cannulas (those big red ECMO catheters in her neck) and she'll be a free lady. Well, closer to a free lady - she'll still be on a ventilator, of course. 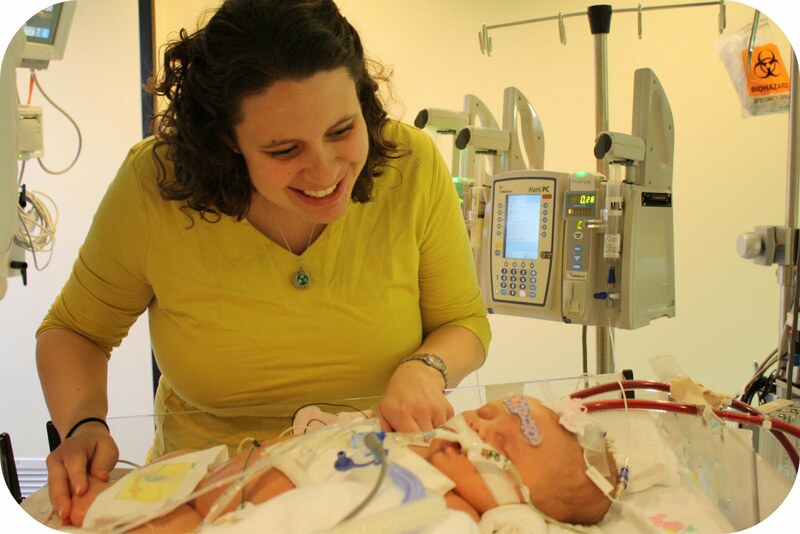 We're hoping that by the weekend we might be saying goodbye to ECMO. Amazing. Unbelievable. Incredible. THANK YOU, GOD!!! - More heart improvement with left to right shunting and pulmonary pressures that are 1/2 to 1/3 of her systemic pressure. - Continued success with diuresis that will take fluid away from her lungs and result in increased lung aeration and growth. - Improved tidal volumes/lung capacity. 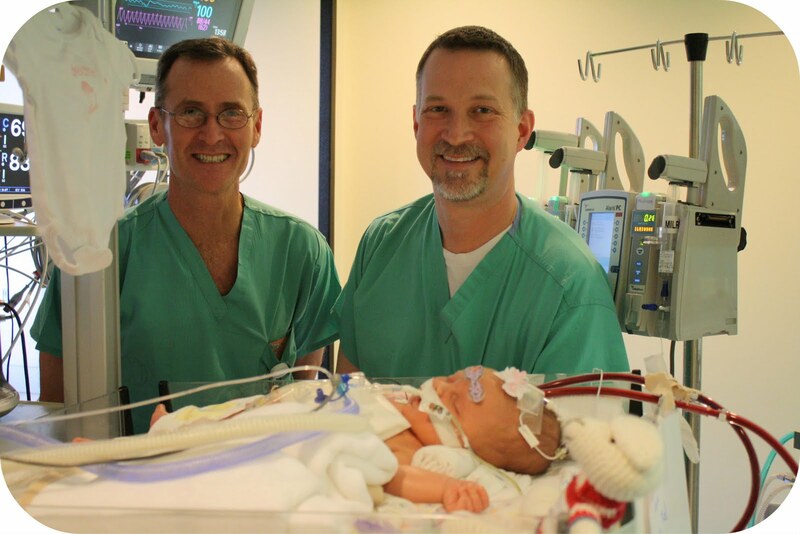 - Continued success with weaning off of ECMO! - Her wonderful doctors, nurses, respiratory therapists and other staff working together to care for her. - Her proud, excited and nervous family who loves her so deeply and is ready for this next big step! - Much praise, adoration and thanksgiving to the One who has brought us this far and will continue to carry and sustain us. Here are some of today's precious photos. Scott and Barney, two of the most wonderful respiratory therapists in the world. We'll be so grateful to be off of ECMO, but we will truly miss the 24/7 attention of this phenomenal team. Pretty in pink today. Not sure when (or if) we'll get her in that special onesie, but we hung it up today to send her positive vibes and great love from her friend Judy and the thousands of others who are praying for her to breathe. This girl's a fighter. She has surpassed the expectations of all the doctors and amazed us all with her determination, persistence and feisty spirit. God has not given up on her and we haven't either. I know there are many more out there who God hasn't given up on either and in whom He would love to see her same fighting spirit. Thanks for being an inspiration to all of us, Clara. We love you. We will continue to pray for you. BREATHE, JUST BREATHE ... something I tell my co-workers often and now I will whisper it to Clara during my prayer time for her. What a remarkable little lady. Breathe, Clara ... grow and be strong. Go Clara! Will pray that she'll be off ECMO soon! I have been following your blog since before Clara came into this world and I have to say, she is SUCH an inspiration as is your family! I happen to be the mommy of a miracle also. My son was born at 23 weeks 2 days. He was not given much hope and faced a VERY long 142 days in the NICU with many ups and downs and several times we thought we were going to lose him. So in many ways I can related to much of what you are going through, although the situations are obviously very different. Clara is a fighter, like my Travis and I have all the faith in the world that she will come out of this and become an incredible little spitfire! My son will be three in July and he is doing absolutely incredible! It is amazing how far these special babies can come! Thanks be to God! Everyday we see God's grace in Clara's life and in the courage and faithfulness of her mom and dad. So many are pulling for the Hardy three!!!! To God be the glory, great things he has done! Oh what a joy to read how incredible she did today during her "dance lessons!" 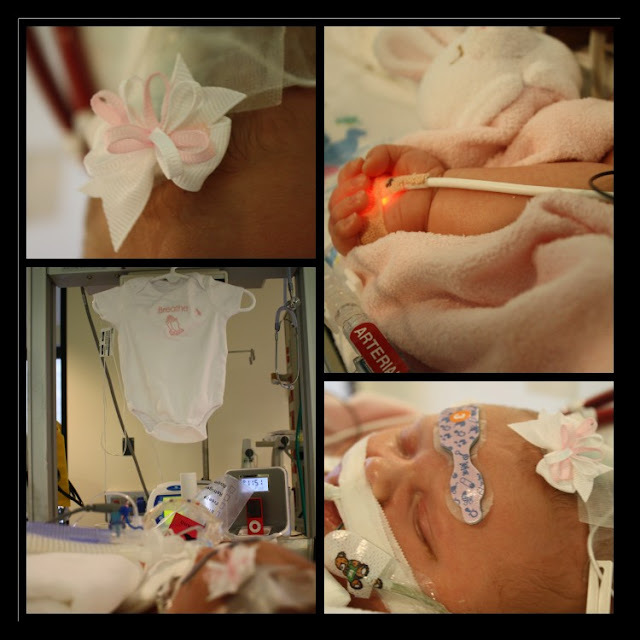 I know the "fight like a girl" slogan is used for breast cancer awareness, but it's appropriate for baby Clara, as well! High five, Clara! Fight Fight Fight Clara! What great news. Celebrate the step forwards. These little ones are spunky! She is stronger that you know. Every night and morning I saw a prayer with my little one not only for Clara, but for your family as well. I know when we were in the NICU traveling the bumpy roads, I needed a lot of strength, patience, hope, rest, trust and more to help me get through as well. Continue to breathe Clara! Hopefully you will be off ECMO this weekend! Baby steps baby steps. God Bless you all! Everyone at Shady Grove loves you Clara and is praying for you continuously. Day by day you will get stronger...keep fighting! God bless you and your wonderful mommy and daddy. She is a "Hardy" girl... just read what is at the top of your blog... could any description of Clara be more appropriate!? (Even the withstanding coldness from yesterday!) So proud of you Clara, and so blessed to be praying for you! What joy to see how strong and resilient she is! All of St. Mark's Presbyterian Church in Tucson raised her up in our prayers on Sunday, and we continue to do so, many times each day--for all of you. Today is God's gift of hope for you!! Blessings! Yes Clara is a fighter and Thank You Jesus!!! I have to look at this Blog every morning so I know what is going on with her. It starts my day. Praise to all of the staff at that Hospital who are there to help God get his job done. The Great People who work there have our THANKS for doing all they can to help her. Praise to you LORD JESUS for putting the right people in the right place at the right time. Clara isn't the only who inspires us. Robert and Chrissy, you continue to inspire us and bring us closer to God through your faith and beautiful words. Thank you! Thankful for ECMO (Enabling Clara [to] Move On) toward breathing on her own, going home, and becoming all that God has purposed for her life. As I lay in bed this morning praying for Clara, my thoughts drifted to last Wednesday when we were all consumed with prayer that Clara would continue to fight and grow stronger. That was a difficult day for you as her parents and also a hard day as thousands of us, with heavy hearts lifted her up in prayer. If I remember correctly that was the day that you two fully put her in God's hands and began the journey of directing all your love, attention and prayer to Clara, forgetting about all the medical part and turning 100% toward her. As I look humbly back, I give Clara's mommy and daddy a lot of credit for where she is today, you gave her fully to God and he began restoring the inside of her and you began building who Clara Mae really is, a special, awesomely wonderful, precious young lady who has a tremendous fighting spirit. It just shows me that when we let go, God is still there, in control and in charge. Much love to you guys. So excited to hear the progress she is making every day! May God continue to bless your sweet family. Little Clara has touched me; I'm honored to be a prayer warrior for her! God is showing us, through her, the miracles He does each and every day right before our very eyes! May He continue to Heal Clara and give you strength and comfort as you watch her grow! In His Love! Praise God that Clara's health is springing forth speedily. She is a beautiful baby! I am continually praying for the Hardy family. so excited for you, Hardy fam! the Lord is such a GOOD God!!!! We got the book, Clara Catepillar, at the library yesterday so that every night we can think about Clara and pray for her with the girls. They love it! Go Clara Go!!! Keep it up! What an inspiration Clara Mae is to all. God is so good and so strong and he is right by Clara's sde. Clara is truly a fghter and we praise God for continuing her life. 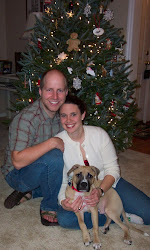 She is a blessing and we continue to pray that Clara will BREATHE. We love Clara Mae! Just want you to know that we have been in your position...exactly...7 months ago at Baptist. We LOVE the staff there and Scott and Barney are some of our faves!! I wish you lots of pee and many hours capped off. Feel free to email/contact if you need to vent or anything with someone whose been in your exact shoes. Many thoughts and prayers for Clara. My family will be praying for your precious baby girl!! Praying for this Sweet Baby Girl.....She is such an inspiration to all of us. All of us have something in our life we are dealing with, but when I look at this little baby fighting for her life, my things are minor. God knows how many are praying for this one little Angel,and God knows how many lives she has touched the short time she has been alive....more than some will ever touch in a lifetime. My love to all of you!!! !